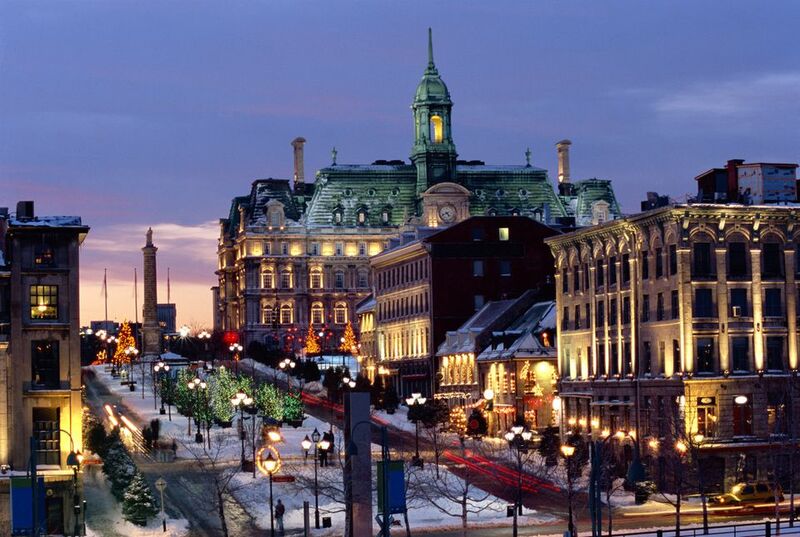 Despite mostly freezing temperatures, Montreal is stunning to visit in December. This French-Canadian city is loaded with history, unique architecture, great food, and a jam-packed events calendar that can keep even the most active traveler busy. Temperatures are chilly, with the weather rarely jumping above freezing on most days, but those who pack and dress appropriately will be rewarded with holiday lights galore, charming Christmas markets, ice skating, and other ways to ring in the season. While summers in Montreal can be muggy and steamy, winters are the exact opposite. The humid-continental climate means that temperatures in December very rarely exceed freezing—nearly 20 days in December are below 32 degrees Fahrenheit (0 degrees Celsius). Montreal festivals are abundant in December because, after all, it's the holiday season. Artisan fairs, parades, carols, freebies, and sparkly decorations multiply as Christmas, Kwanzaa, Yule, Hanukkah and the New Year approach, each in due time, with a backdrop of first snow falls covering the city's nooks and crannies, and a canopy of ice crystals glimmering in the light. It's a beautiful month to be in Montreal. Montreal's best Christmas events include Place Ville-Marie's Christmas tree lighting, Christmas markets including the Place Jacques-Cartier market and the Jean-Talon Market, both great destinations for artisanal-quality gifts. Le Grand Marché de Noël de Montréal (The Grand Christmas Market) is the official holiday shopping destination in Montreal. It moved to a new home in the heart of the Latin Quarter between De Maisonneuve and Ontario streets on St. Denis Street in 2018. From mid-December through New Year's Eve, enjoy Pointe-à-Callière's annual event, "Who Is the Real Santa Claus" featuring holiday characters showing children how the holidays are celebrated in their respective homes. Montreal's Luminothérapie provides relief from the dark. At the Place des Festivals, you'll find a vast playground with the installation "Impulse," a series of 30 interactive seesaws with light and sound. When the seesaws move, you'll see light and sound. Everyone loves playing on the seesaws and creating beautiful light displays. Most, if not all of Montreal's best outdoor skating rinks are open by the third or fourth weekend of December. Montreal has a good variety of skating rinks, and skating trails and not all will cost you. Parc La Fontaine is a favorite place for free skating. You can experience speed skating at Parc Maisonneuve. It will be crowded, but you can head to Montreal's Old Port New Year's Eve for fireworks, ice skating, and live outdoor performances. Stock up on the best cheeses, homegrown veggies, and meats in town at Montreal's public markets, many of which will also feature unique seasonal crafts and goods perfect for last-minute Christmas gifts. The Place Jacques-Cartier Christmas market and the Jean-Talon Market are both great destinations for artisanal and home-made gifts.